Palakkad (also known as Palghat) is located at the base of Western Ghats and is known as Gateway of Kerala. Read the article to know about the tourist attractions in Palakkad. Also known as the Gateway of Kerala, Palakkad (or Palghat) is located at the base of the vast Western Ghats. The region includes high mountains, green forests and rich valleys with rivers and streams flowing through the district. The natural diversity of the region supports a considerable population of animals and birds. It is believed that the history of Palakkad probably dates back to the Paleololithic Period, which is proved by a number of megalithic relics found here. Silent Valley National Park is located in Kundali Hills, which is located 80 km from Palakkad town. The wildlife sanctuary is considered as the last surviving part of evergreen forests in the Sahya Ranges. This beautiful wildlife sanctuary is known for its abundant tropical greenery, heaving slopes, hills and mystical rivers. The flora of the sanctuary includes some of the rare and unique herbs, which are found only in this region. Silent Valley National Park is a paradise for natural lovers as they can easily spot elephants, tigers and lion-tailed macaques strolling in the vast ranges of sanctuary. Also known as the ‘Vrindavan of Kerala’, Malampuzha includes a dam and a garden. It is located at the lower hills in the Western Ghats and is a popular picnic spot. The picturesque garden has flourishing green lawns, numerous flower beds, pools, fountains and avenues. The garden also includes special attractions for kids, such as fresh water aquarium, Snake Park and a toy train in the Children’s Park. Visitors can enjoy a pleasure boat ride along the reservoir. Spread over a vast area of 285 sq. km, Parambikulam is one of the important national parks located in Kerala. Parambikulam National Park houses a range of dams and reservoirs, which provide the opportunity of memorable boat cruises. The wildlife sanctuary contains a considerable population of Bison along with other species of animals such as elephants, sloth bears, chital tigers, wild boars, sambhars, panthers and crocodiles. Nelliyampathy is a cool hill station located 75 km away from Palakkad. The tourist spot offers breathtaking views of the evergreen forests of Sahya Ranges. From this place, tourists can enjoy a wide panoramic view of Palakkad. Due to the presence of high mountains, it is ideal for trekking activities. Dhoni, which is located 15 km away from Palakkad, offers stunning views of the evergreen forests and fabulous waterfalls. The waterfalls site provides a good opportunity for trekkers, as it takes 3 hours of mountain climbing to reach here. Dhoni is also well known for its farm house that contains hundreds of cattle of high breed. Attapadi is a high mountainous plateau situated in Western Ghats. From this plateau, visitors can have striking view of nearby mountains. Known as one of the best preserved forts in Kerala, Palakkad Fort was built by Hyder Ali of Mysore in 1766. Later, it was captured and modified by English in 1790. This historical fort is under protection of Archeological Survey of India. Visitors can experience the valor and spirit of Martyr in Martyr’s Column. For children there is a Children’s Park near the fort. Located 48 km from Palakkad town, Siruvani is best known for its rich green forest cover containing various wild animals. Siruvani is also famous for its splendid waterfalls, dam and gateways made on the sides of the roads. These gateways are classic examples of the traditional architectural styles of Kerala and Tamil Nadu. 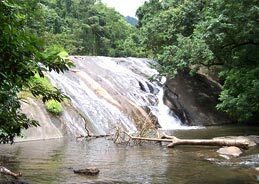 One more worthy addition to the spectacular waterfalls near Palakkad is Meenvallam Waterfalls, which is located 37 km from Palakkad. It is peculiar for its 10 steps of waterfalls, with variation of height from 5 to 45 meter. The nearest airport to Palakkad is Coimbatore International Airport, which is 55 km away from Palghat town. Palakkad Junction is a major railway station located 5 km from the main city. A wide network of roads connect Palakkad with other major cities of the state.